Liz Kislik is a nationally acclaimed management consultant and business coach. For more than 25 years she has focused on solving thorny problems and advancing business results for her clients, from the Fortune 500 and national non-profits to family-run businesses. Liz assesses and facilitates teams and restructures processes to help organizations strengthen their top and bottom lines. She develops higher performing workforces for leading organizations, such as American Express, Orvis, The Girl Scouts, Guthy-Renker, Staples, American Red Cross, Philips Lifeline, Edmund Optics, HearUSA, Road Scholar, and Highlights for Children. Liz is a sounding board for CEOs, presidents, and business owners, and she coaches and mentors employees from the C-suite to the contact center — always motivating them with her wit, wisdom, and humanity. 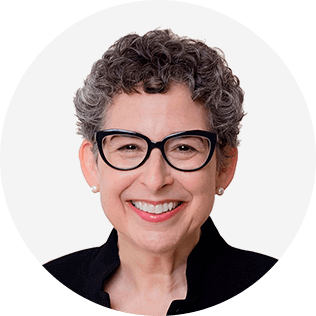 As a frequent contributor to Harvard Business Review, her work also appears in The Harvard Business Review Guide to Dealing with Difficult People. Many business people also know Liz as the author of Workplace Wisdom, a frequently cited blog offering valuable perspectives and tips for developing leaders, managing teams, and improving the customer experience. She has spoken at TEDxBaylorSchool as well as at industry conferences such as NCOF (National Conference on Operations Fulfillment) and NEMOA (National Etailing and Mailing Organization of America), and has served as adjunct faculty at Hofstra University and New York University. Liz believes strongly in giving back to her communities and has spent many years in nonprofit board service, including for the Direct Marketing Association, the Hewlett-East Rockaway Jewish Centre, where she also served as president, and Marketing Edge, where she is a member of the Executive Board. Liz received her MBA from NYU and her BA from Yale. One of the toughest things to do at work is to lead a team or a group when you’re not the person with formal authority. It can also be one of the most important, if the senior leaders are weak, distracted, unskillful, or conflict-avoidant. By using a wide range of techniques and approaches from emotional grounding and team development to Commander’s intent and “Giving Yourself an ‘A’” (Zander), coaches can help clients galvanize team members to handle important work, resolve problems, and make pragmatic plans that move the business forward — even if those things are not in their job descriptions. Many people in workplaces hold the mistaken belief that conflict wouldn’t exist if the difficult people who cause it would just get themselves together and work things out. But those difficult people are just the part of the story that’s easiest to see. If we’re going to learn from a conflict and really solve it — at work, at home, anywhere — we have to do some deliberate digging and assess the structures that lie underneath the conflict. In this session, we’ll look at some road-tested approaches that you can use to dig down below the obvious interpersonal challenges, and see what might be keeping those people locked in battle. We’ll explore techniques to help the participants bring the crucial issues to the surface, recognize what they bring to the conflict, evaluate alternative explanations of events and communications, and practice more effective interactions. 1. The trigger questions that will help you uncover what’s previously been hidden and bring crucial information to the surface. 2. How to help opponents see the entire business situation from each other’s point of view. 3. Techniques for improving both the content and the delivery of conversation on contentious topics without seeming soft or at a disadvantage.